Buy Mr. Ed on DVD! 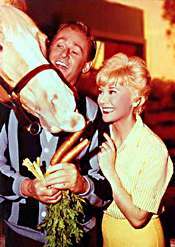 Mr. Ed Cast – Weel-burrrr! 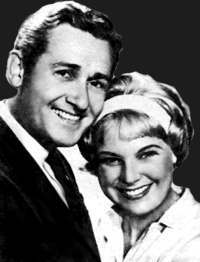 Wilbur Post (Alan Young), an architect, and his wife Carol (Connie Hines) moved into a new home. What they discovered was the previous owners had left behind their horse stabled in the barn. What Wilbur discovered was that the horse could talk! But oh, no, he choose to talk only to Wilbur! 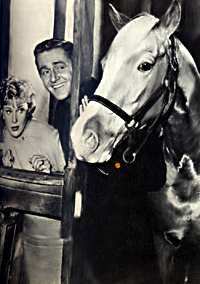 The star of the show was unquestionably Mr. Ed, whose voice was provided by Allan “Rocky” Lane. Mr. Ed had opinions. He could be cynical. He had his moods. A thoroughly modern horse. 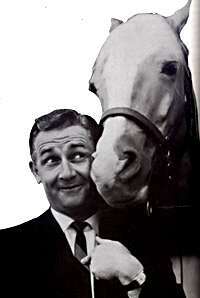 It was Mr. Ed’s personality and his ability to get WIlbur into trouble that kept us turning in each week. Larry Keating died in 1963 of leukemia, Alan Lane on 1973 of bone cancer, Jack Albertson in 1981 of cancer, Leon Ames in 1993 of a stroke, Sherman Allen in 2002 of bone cancer, Connie Hines in 2009 of heart disease and Alan Young passed of natural causes in 2016 he was 96 years old. He was a Palomino who weighed 1100 pounds. Although in the show Mr. Ed was 8 years old, Bamboo Harvester was actually 11. He was purchased for $1500. Bamboo Harvester died in 1970. He suffered from a number of ailments and was put to sleep.